Driving north on one of Colorado Springs busiest six-lane highways the other day, I spotted a bird at the very top of the high-power lines that run along side the highway. Usually, Bill tells me he cannot stop, but this time he quickly veered to the left turn lane to make an illegal u-turn as we thought it was a Great Horned Owl. I jumped (barefoot) out of the car and started taking pictures while Bill found a near-by parking lot and pulled out his binoculars. 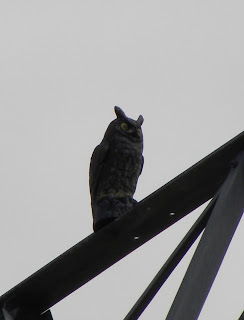 We both realized quite soon that -- yes, it was a Great Horned Owl, but -- no, it was not real -- but not before we stopped traffic with everyone looking up to see what we were looking at. How embarrassing! 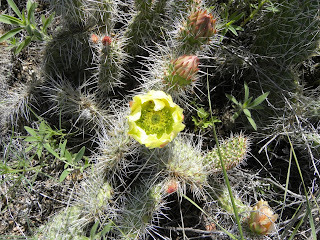 Today, at o'dark-thirty we went to Midway so Bill could fly his RC plane with Tim and I could look for desert birds. 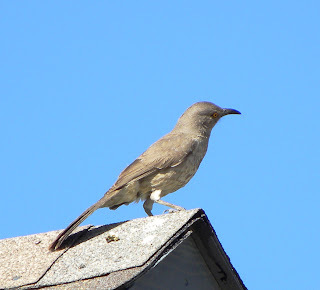 This is a Thrasher - I think a Curved-bill Thrasher. 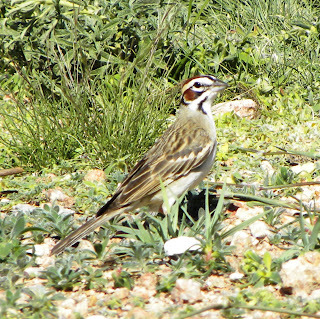 We saw two Lark Sparrows. They are one of the most dis-tinguished sparrows with their distinct head markings. A Western Kingbird (I have been corrected - this is a Say's Phoebe - even more exciting!) was gathering twigs to build his nest. The feeder was busy! 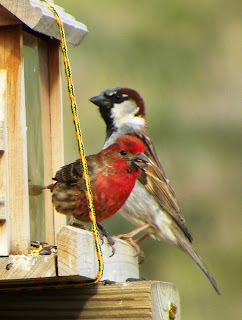 In this picture a House Finch and a House Sparrow (sometimes called an English Sparrow) share a meal. House Sparrows are not Sparrows at all - they are Finches that were introduced into this country from England in the late 1800's. 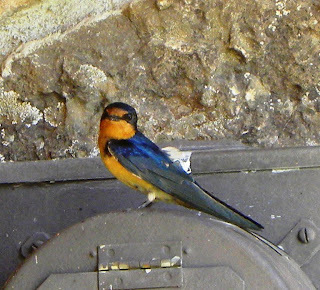 They quickly adapted, and are now widespread. The flowers are beautiful. I don't have a clue what these are - but I like them. 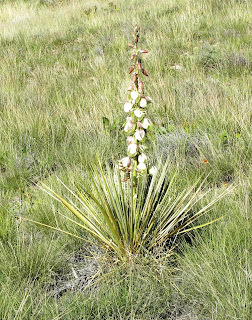 This is a Yucca - in bloom. 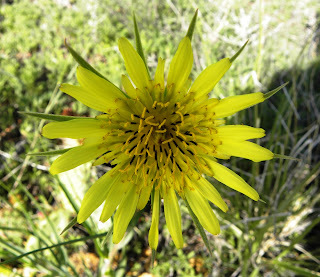 We have some of these in the yard - and they are impossible to get rid of. 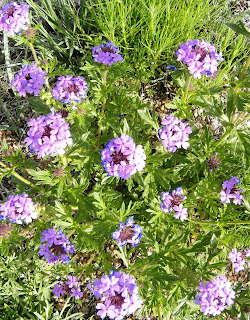 I especially like this picture; one, because the flower is pretty and, two, because I was able to get the focus correct. 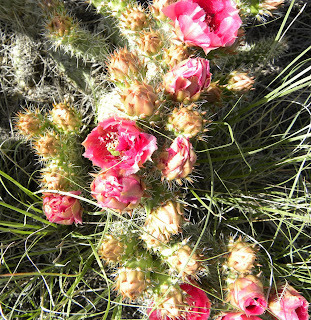 The cactus were in full bloom - lots of colors. After we left Midway, we went for a short hike in Fountain Valley Park. 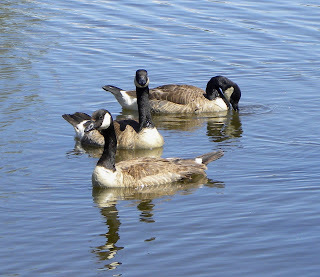 There were lots of Canadian Geese on the ponds. They are attractive birds - but they sure can make a mess! 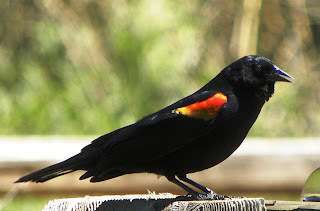 Another bird that is abundant near water is the Red-winged Blackbird. This is the male. 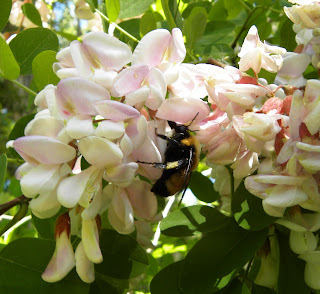 This tree - abundant with huge pink flowers - smelled delicious. This bee thought so too. 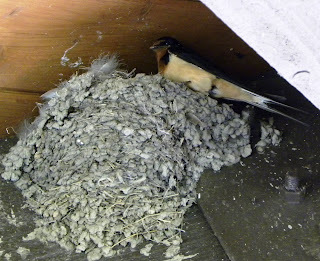 Inside one of the shelters, we found three Swallow nests. 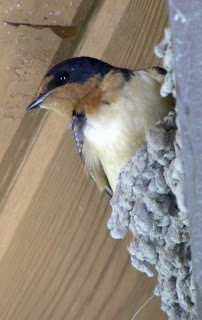 This is a Barn Swallow. They make their nests with mud. 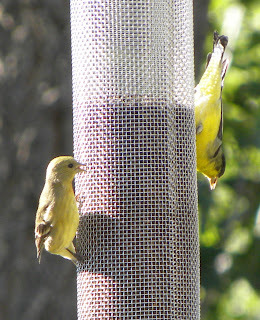 When we returned home, we had new visitors at the Finch feeder. At first we thought they were regular Goldfinches. When we took a closer look at the male - and his black back with white on his wings - I headed for my bird books. This, I believe is a pair of Lesser Goldfinches. 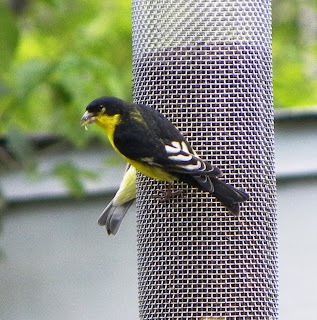 They are smaller than regular Goldfinches and we have seen them several times eating the thistle seeds in the mesh feeder. 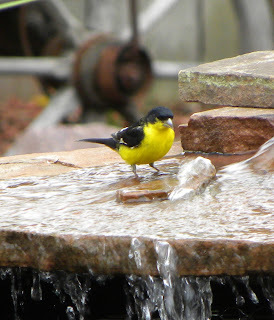 The male is enjoying the new waterfall we are building on the pond. We have also seen Spotted Towhees in the yard. They are ground feeders, so I sprinkled sunflower seeds by the feeder. Unfortunately, the squirrels like them also. The squirrels are no longer able to get to the feeders - but we have a new fight - Starlings! We had to change our entire set-up to keep the Starlings from eating all the seed. It's a constant battle - but I think we are winning. 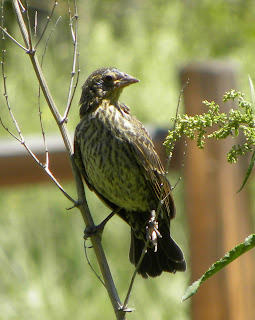 I found your blog through a freind's blog and have thoroughly enjoyed looking at all the photos of the birds you have come across while hiking. Great photos!!! Living on the planis of eastern CO, we seldom see many of these birds on a daily basis, other than during migration and some, never. 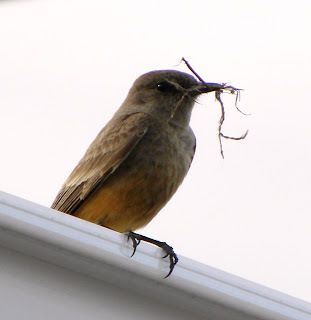 I believe the bird you have labeled "Western Kingbird" is a "Say's Phoebe" though. The Great Horned Owl rendition was great! !